The National Auto Dealers Association will help service centers avoid becoming Senior Centers next month with a workshop titled, 5 Ways to Engage the Next Generation of Owners. NADA has selected DMEautomotive, a leading authority in analysis based, goal-driven automotive marketing, to present the workshop – a step-by-step guide to building loyalty and capturing the next generation of automotive customers – at their annual Convention and Expo in Orlando, FL. The workshop will be delivered by Steve Dozier, Director of National Training for the firm, will explain how dealers can cope with an progressively less loyal service customer and engage the current generation of service customers. The situation is complicated by a tendency by a significant portion of those under 30 to put off auto ownership until later in life. Auto dealers have high overhead from brightly lit showrooms, expanses of county assessed land in addition to extensive inventory requirements and seldom make a buck by selling new cars. The profits in the high risk/high reward industry come from servicing the vehicles they sell and providing the accessories the customer wants. "Our research shows that without serious change dealerships, whose loyal customers tend to be between 55 and 75 years old, are at risk of becoming Senior Centers," said Dr. Mary Sheridan, research director at DMEautomotive. "We surveyed thousands of consumers about their service behavior, and what we found has shaped our understanding of the next generation. In this seminar we'll share 5 ways to engage the next generation of vehicle owners, including practical advice to help dealerships implement the programs necessary to keep those customers coming back to their showrooms and service bays." The image above is symbolic of the storms that may be brewing over Dealer Service Centers in the new few years. Believe it or not, all this takes only 75 minutes. The workshop will be presented at three different times during the 2013 NADA Convention at the Orlando Orange County Convention Center next month. A service center waiting room full of gray-haired, balding men in Hawaiian shirts and khaki shorts reading Smithsonian or Scientific American is well worth avoiding. 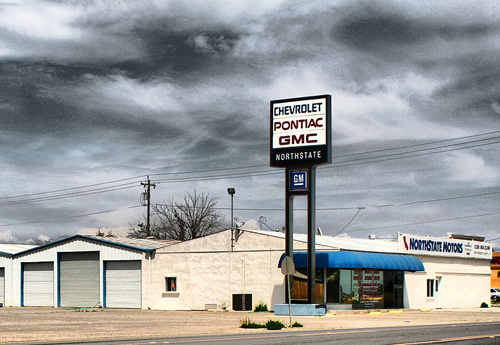 Image source: A closed GM dealership photographed by John Martinez Pavliga of Berkeley, CA. Used under Creative Commons Attribution 2.0 Generic license.